The 2014 and 101st edition of the Grand Boucle (the Tour de France) is around the corner and due to start this weekend. So the Southern hemisphere insomnia of July is due to hit as well. To get into the spirit I am nerding up on a few books that celebrate the most gruelling sports event in the world (N.B. I don’t want to get into the argument of whether the Giro d’Italia is really the tougher race). Thanks to my father in law Benny (and the incompetence of international snail mail) I received two books about the Grand Boucle for Christmas. This post is about the first of those two. This book is fantastic for any cycling fan. Us cyclists are a strange type of athlete (pro, amateur, wannabe pro, or otherwise) in that there is just as much focus on geography and stats as there is in the effort. I find myself “analysing” my rides and bike travels in my post ride review. The analysis is not just on my performance (or lack thereof) but also the route traveled. So this book ticks a lot of these analysis boxes for the big race as well as the historical race results. The foreword for the book has been provided by none other than the Manx Missile himself – Mark Cavendish. I like Cav a lot, he is a racer, but am not too fond of his post race interviews. But what is surprising about his quick writeup is the respect he shows to the race and what is required from all of his peers to compete in this ultimate of physical challenges. The main body of the book itself is centred around the geography of the race. When I had the opportunity to attend a talk by the Director of the Tour de France, Christian Prudhomme, he explained to us that planning the route for the race was a painstaking three year exercise and it was planned down to the local street level within the towns. But it is not just an exercise of ‘which towns are we going to visit this year’, but there is also the technical and logistical details of the race itself that have to be accommodated. After all, the race is over 3,000km in length over a period of 23 days with 2 rest days. The course has to be a mix of flat stages, rolling hill stages, and mountain stages so as to cater for all types of riders in the pro-peloton and provide a mix of sport entertainment. Each of the 100 editions of Le Tour has a few pages dedicated to detailing what happened at a summary level in the race and which cyclists were the main protagonists in the event. Coupled with this is a detailed map with of all the stages marked up on it. The scale of the maps is such that the subtle route changes around the towns don’t get picked up in the route delineation. This also means that the all the mountain switchbacks are lost in the route delineation too. I do like the illustrative style of the maps, which is more akin to that the paper atlases I was familiar with as a kid growing up before the days of Google Maps. There are icons that denote what type of stage it is (flat, hilly, or mountain), but one negative is that there are no notations on the category of climbs for the mountain or hilly stages – after all not all mountain stages are equal. 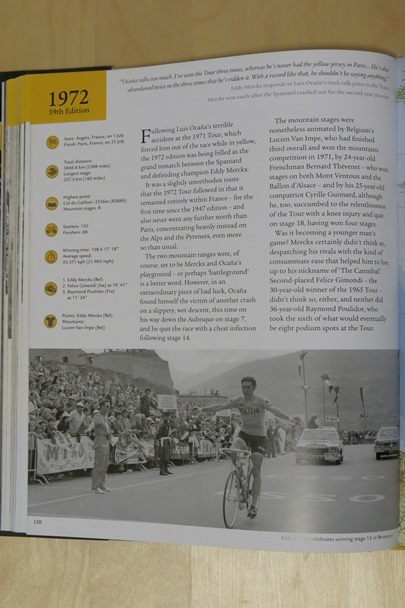 The book has some key stats on the iconic climbs of Le Tour, but again given the detail in the rest of the book I was wanting more (I have another book for that). There is a spread on the stats about the winners of Le Tour and the holders of the Maillot Jaune (yellow jersey). Again I wish they had similar statistics for the other jerseys; points (sprint) – green, climbers – red polka dot, and youth – white. One interesting aspect of the book is its treatment of the doping controversies. It doesn’t mince its words at all, and correctly identifies the official omission of the winners in the doping years. The photography is fantastic and this book serves as a great collection of some of the vintage photos of the early decades of the race. Now here is where I have a personal, or should I say Australian, gripe. There is not a showpiece photograph of Cadel Evans. I know the author is British, but Wiggo has only won the race once and never before taken a podium place. “Cuddles” on the other hand hopped on the top step before him, was on the second step a couple more times, and never had the team (or team funding) like Wiggo did to deliver the goods (N.B. I am not taking anything away from Wiggo – but give Cuddles his due). After each of the previous editions, the book contains a detailed stage by stage preview of the 2013 and 100th edition of the Grand Boucle. This part of the book is fantastic because it also delves into the local history of the geographic region that the race is passing through. 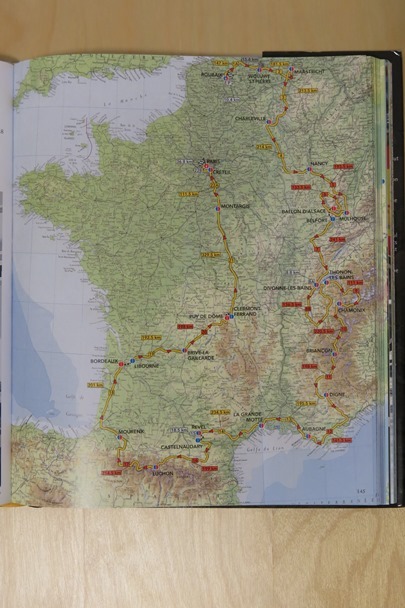 The final part of the book is a write up of what the author considers to be the most memorable locations visited by Le Tour. Locations like le Mont Ventoux, Col du Tourmalet, and Col du Galibier are given the attention that they should. Overall, I think this book is great (thank Benny)! It could be improved in parts, but that is me being a nerdy cycling fan – give me more detail. The book is rich and comprehensive and fills in a lot of details that I have not read about before. 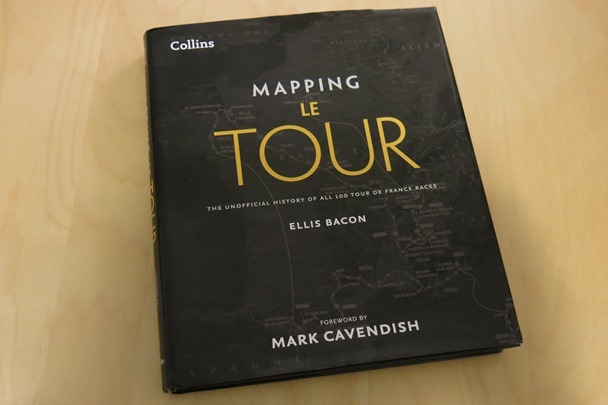 The book is very well written and reflects the experience that Ellis Bacon has as one of the modern era’s premier English language cycling journalists. When I compare this book to the details held on a site like Wikipedia, this book wins hands down. I was very happy when this book arrived, and I think that this will be one that I nerd up on in the years to come. I only wish that there was a way in which I could append future editions of the race. I give this book 4 cranks out of 5. Have you ever been over to see it live? If not, you really should put it at the top of your bucket list–it is crazy! I was working in Paris in 2004 on the failed bid for the 2012 Olympic Games. I was right on the Champs Elysees for the final stage – manic! We were planning to go this year, but a little bundle of joy got in the way. Maybe next year, and I could squeeze in a bike tour following the race. I am an amateur, wannabe pro, but this looks like a great book. Will you do part of it in a more leisurely fashion? I’m an amateur wannabe pro to. When I finally do get around to doing part of it, it will definitely be leisurely – I want to enjoy every part of the area that I am riding in.